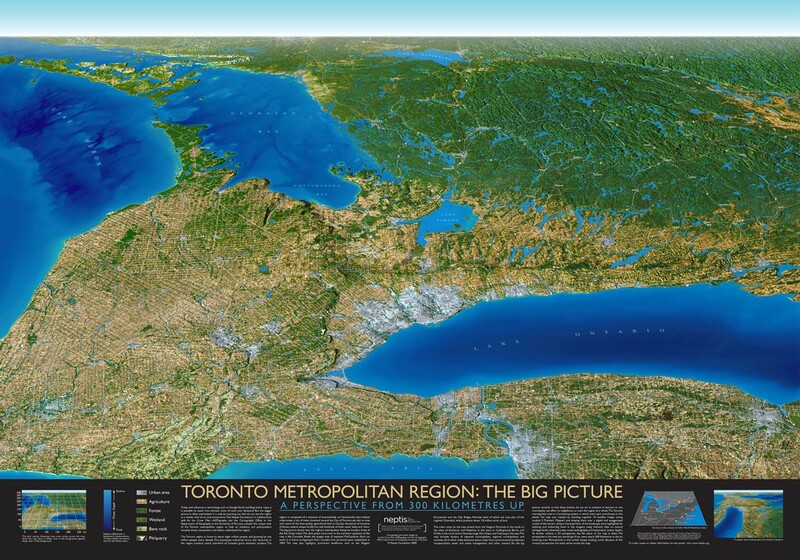 The Neptis Foundation, in collaboration with As the Crow Flies cARTography and the Cartography Office in the Department of Geography at the University of Toronto, created this unique view of the Toronto metropolitan region to help its residents and policymakers visualize those connections and better understand the region. The map was created by stitching together 16 satellite images (using Landsat 5 Thematic Mapper) and draping them over a digital and exaggerated model of the terrain. Unique characteristics of the landscape were highlighted by isolating and enhancing them in the imagery using thematic data such as natural heritage lands, urbanized areas, roads, hydrography, and bathymetry (water depth). To further achieve a 3D perspective, the flat plane of the map is tilted. The perspective is the view you would get if you were up nearly 300 kilometres in the air, hovering over Pennsylvania in the United States, looking north. Because of this unusual perspective, the scale varies across the map. For more details on how the map was created and how it can be used, please contact Marcy Burchfield (details above). A copy of the poster is available for $20.00 (plus shipping and handling). Please contact publications (at) neptis (dot) org for more details.